There’s a lot to recommend about DerbyCon, the homegrown computer security conference based in Louisville, Kentucky. The buzz in the air during and leading up to the conference is palatable and unlike any other InfoSec conference you may have attended. This year’s 2018 DerbyCon theme is “Evolution” and—after kicking off on what was probably the busiest news day InfoSec has ever seen—this year’s Evolution theme couldn’t have been better chosen. Insightful and informative scheduled talks and conference floor conversations are happening everywhere you look, including in the informal and free-to-attend lobby area of the venue (affectionately referred to as LobbyCon). Of course, Binary Defense is out in full force as a DerbyCon Platinum sponsor and proudly boasts our own Binary Defense CTO Dave Kennedy as a co-founder of the event. Our booth #4 is situated right at the front entrance to the conference floor alongside our TrustedSec IT Security Consulting sister company. 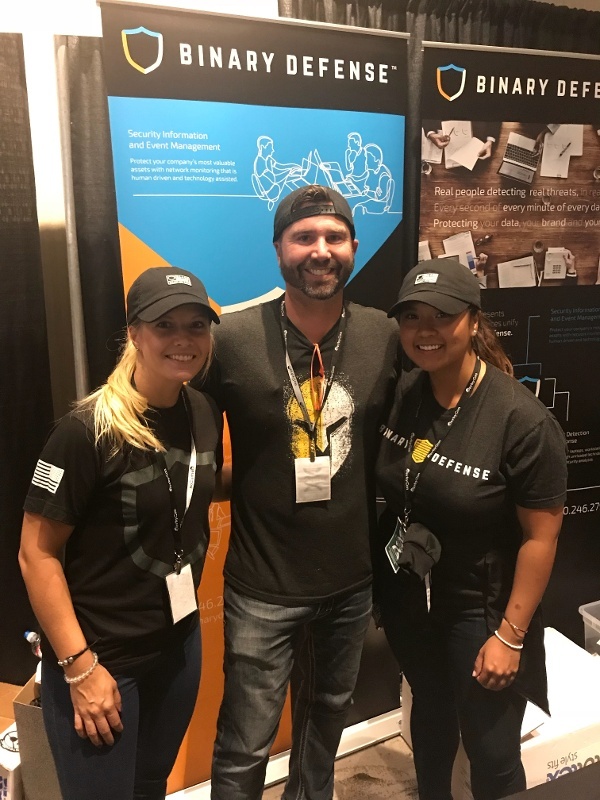 The Binary Defense team are all smiles and having fun at DerbyCon 2018. We hope as you entered the DerbyCon conference floor you took a moment to say hello to us . We have a busy location where we happily enjoy the opportunity to meet a lot of new friends! Drop by Binary Defense booth #4 to say hello and enter our contest to win a Google Home! 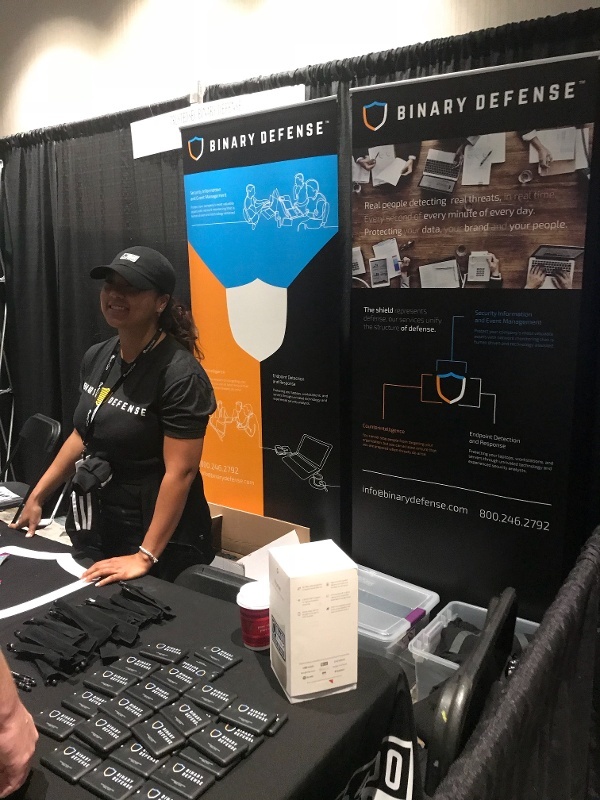 At the Binary Defense booth you can learn about who we are and what we offer, get some good swag items and join our mailing list to discover even more unique items (like challenge coins) as well as be the first to hear about our special event announcements (like our recently launched S.E.N. event series). And yes, we got swag waiting for you! 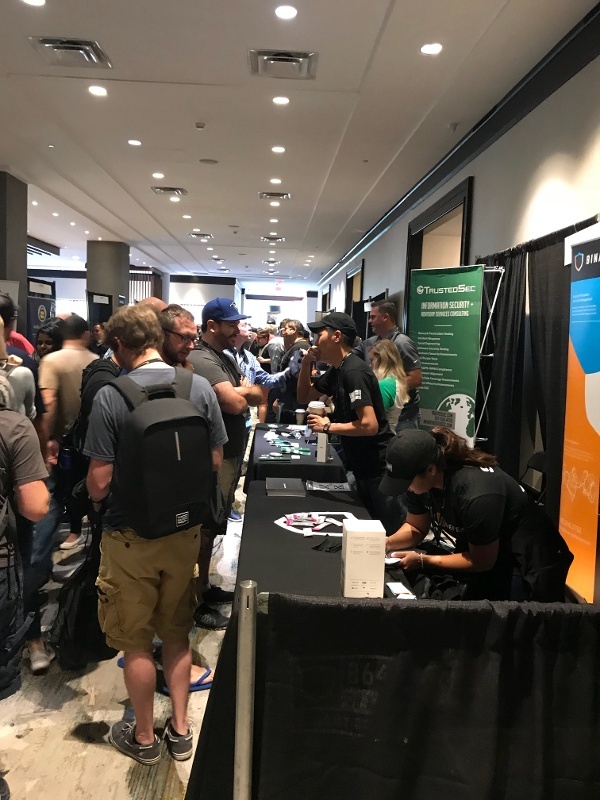 The feeling we get at DerbyCon is a strong confirmation of the people we meet—a vibrant, innovative, and close-knit community of InfoSec practitioners—real security professionals that we identify with and are proud to engage and learn from. The conference has it’s own unique and sometimes unusual memes that make the experience special and memorable and also a lot of fun when you get involved. It’s also a family-oriented affair so you don’t have to leave the kids at home. Instead bring them along to learn first-hand STEM knowledge from some of the best in InfoSec. And the conference talks are second to none—with the added bonus, for both attendees and non-attendees alike, that every talk is posted and streamed online so you don’t have to miss a thing! One of our favorites is the polygraph lie-detector test challenge. Are you daring enough to take a polygraph in front of the DerbyCon crowds? And did we mention the DerbyCon parties? If you know engineers, you should know they are the hardest working people on the planet. And when they finally get some deserved time off to come together you can bet they are the most engaged people to go out with, paint the town red, and create outstanding experiences with a real sense of togetherness. And conscious DerbyCon provides a safe space for everyone to engage and join all the fun happening at the show. Even local business surrounding the venue are keenly aware of the InfoSec event and share their excitement with anticipation whenever the DerbyCon folks come to Louisville. Are you going to DerbyCon? Have you seen and heard enough and are you either at DerbyCon today or planning to attend in the future? Binary Defense, Dave Kennedy, and our entire team (we sent 20 people to the show this year!) are all waiting to meet you, to chat about security, and to share our knowledge and learn from you. Tell us about your experience and share your stories on Twitter using #DerbyCon. We look forward to seeing and hearing from you. Thank you DerbyCon!